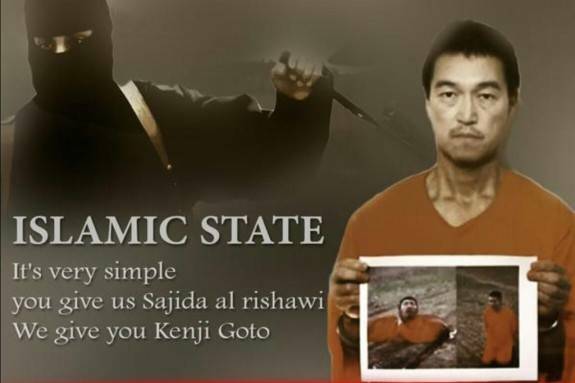 AMMAN, Jordan -- An online video released Saturday night purported to show an Islamic militant behead Japanese journalist Kenji Goto, ending days of negotiations by diplomats to save the man. The video, released on militant websites and highlighted by militant sympathizers on social media sites, bore the symbol of the Islamic State of Iraq and Syria's al-Furqan media arm. Hours after the video's release, Japan's defense minister said that it appeared to be genuine, the Reuters news agency reported. It conformed to other beheading videos released by the extremists, who now control a third of both Syria and neighboring Iraq in its self-declared caliphate. The video, called "A Message to the Government of Japan," featured a militant who looked and sounded like a militant with a British accent who has taken part in other beheading videos by the Islamic State of Iraq and Syria, or ISIS. Goto, kneeling in an orange prison jumpsuit, said nothing in the roughly one-minute-long video. "Abe," the militant says in the video, referring to Japanese Prime Minister Shinzo Abe, "because of your reckless decision to take part in an unwinnable war, this man will not only slaughter Kenji, but will also carry on and cause carnage wherever your people are found. So let the nightmare for Japan begin." U.S. officials said they were trying to confirm the authenticity of the video. "We have seen the video purporting to show that Japanese citizen Kenji Goto has been murdered by the terrorist group ISIL," said Bernadette Meehan, a spokeswoman for the White House's National Security Council, using an alternate acronym for the extremist group. "The United States strongly condemns ISIL's actions and we call for the immediate release of all the remaining hostages. We stand in solidarity with our ally Japan." Goto was captured in October, after he traveled to Syria to try to win the release of Haruna Yukawa, who was also purportedly killed, according to an online message released last Saturday. The U.S. intelligence community has said that it had no reason to doubt the authenticity of that message. Saturday's video made no mention of another hostage, Jordanian pilot Lt. Muath al-Kaseasbeh, who was captured after his fighter plane went down in December over an ISIS-controlled area of Syria. The fate of Goto and al-Kaseasbeh had been linked by the militants. ISIS purportedly threatened to kill al-Kaseasbeh by Thursday unless Jordan released a female al Qaeda prisoner, Sajida al-Rishawi, from death row. Jordan has said it cannot release her without proof the pilot is alive. CBS News correspondent Charlie D'Agata reports that the hostage crisis has left Jordan with tough choices. Handing over the prisoner will be seen as caving in to ISIS, but pressure has been piling on Jordan's King Abdullah from the public and the pilot's influential family to bring him home, that trading a failed bomber for a heroic pilot is the right thing to do. The hostage drama began last week after militants threatened to kill Goto and Yukawa in 72 hours unless Japan paid $200 million. Jordan and Japan reportedly conducted indirect negotiations with the militants through Iraqi tribal leaders.